In small saucepan, combine dried fruit and orange juice. Bring to a boil. Remove from heat and let stand for 5 minutes to plump fruit. Drain and discard liquid. In medium bowl, combine diced mango, plumped fruit, brown sugar, orange peel, crystallized ginger (if using), and vanilla. In small bowl, sift together cornstarch and spices (including ground ginger, if using) and add to mango mixture. Preheat oil in Presto® electric deep fryer. If using an adjustable thermostat deep fryer, set at 375°. Heat flour tortilla in dry medium skillet over medium heat, turning once, until pliable, about 30 seconds (or microwave, covered with paper towel, 20 to 30 seconds). Place warmed tortilla on work surface, position 2 to 3 tablespoons of mango mixture, draining off any accumulated juices, on bottom half of warmed tortilla, 1 inch from edges. Fold up bottom of tortilla. Brush egg mixture on top semicircle of tortilla. Fold in sides and then continue to roll up into a thick cylinder. Repeat with remaining filling and tortillas, allowing egg whites to dry so tortillas are well sealed. Fry chimichangas in hot oil until golden, about 3 to 4 minutes. Do not crowd fryer. Transfer fried chimichangas to a wire rack set over a shallow baking pan. Chimichangas may be held in 200°F oven until remainder are fried. 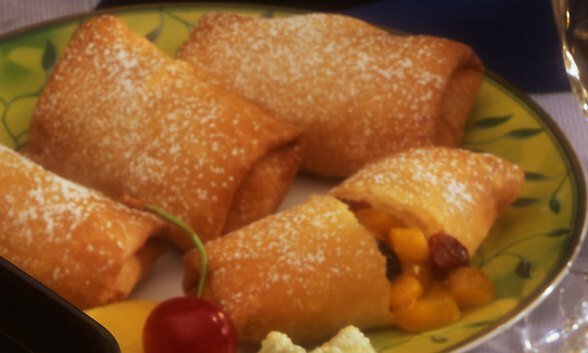 Sift powdered sugar over warm chimichangas and serve.